A well-worn path leads inquisitive visitors to Tommie Bass simple home nestled against the bottom of Shinbone Ridge. Its a path worn smooth by the feet of faithful, simple country folk as well as the rich and famous. The wiry, white-haired gentleman has spent over eighty of his eighty-eight years as a mountain herb doctor. Usually dressed in overalls, he has given most of his life to treating the people of Cherokee County and surrounding areas. When asked about his calling, Tommie simply replies, I try to give em ease. Dont go looking for Tommie to pass out instant cures. He says his life has taught him otherwise. His philosophy is more pragmatic. He only seeks to help nature take her natural course to healing and good health. Tommie willingly shares his life story and herbal knowledge with all who seek his company or advice. An ancient but active pot-bellied stove dominates Tommies shack on cold wintry days. It easily diverts ones attention from the coldness outside to the open warmth of Tommie Bass heart. The walls of the shack hold photographs of friends, presidents, patients, and newspaper articles attesting to his uniqueness among men. From overflowing bureau drawers come rich treasures of older almanacs, fading letters and ration stamps from wars long since fought and won. Tonics and liniment, carefully bottled, crowd a small cabinet leaning cautiously against a wall. Known as the Shack, the multi-windowed dwelling was hand built by Tommie during his seventies without help. However, Tommie is quick to point out that once a visitor did pass a board up to him on the roof. Over crowded before it was finished, the 15-by 30foot structure is solid, warm and cozy. It easily withstands the buffeting, chilly winds that sweep down from Lookout Mountain during the winter. Leesburg, in rural Cherokee County, is home to this 88-year-old patriarch of the few surviving mountainRabbit Tobacco herbalists. In every way, Tommie Bass is a living American Treasure. Have an ache or pain? Ask Tommie and hell provide you with some ease. As Tommie says, I dont claim a cure...l just try to give people some ease. Plants used to provide this ease vary greatly. Tommies immense knowledge of herbal lore encompasses more than 300 plants in his personal pharmacopoeia. For sinus trouble, he may recommend drinking a tea of Wild Cherry Bark or inhaling the steam from a boiling pot of Rabbit Terbaker. Overweight folks will be told the wonders of Chickweed and Queen Annes Lace. Theyll do the trick! Women suffering from what Tommie calls Womens Trouble need to know there is nothing like Red Maple, Black Cohosh or Squawvine tea. Pokeroot is good for the itch and, Of course, says Tommie, Yellowroot will cure stomach ulcers. To hear Tommie tell it is to know that Wild Cucumber Tree bark and Prickly Ash are the most wonderful things in the world for arthritis. The son of a fur dealer, trapper and farmer, Tommie learned his trade in the school of hard knocks. He graduated at the top of his class. In his earlier years, a child as young as the age of six had to make a hand and help on the farm as best he could. Herbs became a means of escape from a life of extreme hardship for Tommie. Along with fur trapping, herb digging provided an income that meant the difference between having or not having such essentials as shoes and a change of clothing. This was incentive enough to be out wild-crafting for the medicinal barks, herbs and roots demanded by the drug industry. Over the years as his knowledge of herbal medicines grew, Tommie became much sought after for his ability to find just the right herb to ease up an ailment. Things arent so hectic for Tommie now, although he is much in demand nationally as a guest speaker. You are most likely to find him building a dog house for a customer or on the roof mending a leak. Greeted with a Howdy neighbor! a request for a moment or two of conversation easily melts into an hour or more. Tommie Bass fascinates fortunate visitors with songs and stories from younger years. Intertwined with these stories will be found valuable advice on herbs and their proper usage. As long as there is a speck of sunlight, it isnt necessary to ask twice for a tour of his yard, nearby fields, woods and mountains, all filled with herbs. There are many offerings at any time of the year. Finally, as you reluctantly take your leave (not an easy task in itself), your hands will be full of some expression of Tommies life and skills as an herbalist. Dried apples, herbs for your ailments, cough and cold medicine...you just cant leave empty handed. Even while leaving, you plan your next visit to this simpler place from a simpler time. Like Mayberry, USA, Tommie Bass is an institution, a gentle man whose basic philosophy of life is to bring some ease to those in need. I first met Tommie Bass as a result of several people telling me stories of the Herb Man up in Leesburg not far from where I lived. It seemed as if I were constantly running into people who either knew of him, or had family who knew and had been treated by this white-haired gentleman. Reading about him on the front page of the Wall Street Journal in 1985 had also served to pique my curiosity. My first trip to his home was one which I will never forget. It also served to show me a little of the extent to which he is known and respected in his community. Even without an address to go by, and I had no trouble finding his house. All I had to say was that we were looking for Tommie Bass, the Herb Man, and people immediately told us how to find him. For the next two hours, I was treated to fascinating stories of Leesburg and Lookout Mountain in the first half of this century, stories of herbal treatments, and even a couple of songs played on the French Harp. It turned out to be the most interesting day of my life. I found Tommie to be the most humble and guileless person I had ever met. There is nothing pretentious about this man. What you see on one visit is the same person you see on subsequent return trips. His overriding concern is to bring some ease to his fellow man. He is not out to make a dollar at the expense of others ailments. He is a seeker of neither glory nor fame. The biggest result of my visit with Tommie was the birth of an intense interest in learning to identify and use the various plants he had shown on that day. With no charge he willingly shared his immense knowledge. He kept no secrets and demanded nothing in return. 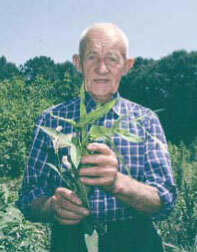 Periodically, I still take various plants to him that I have collected in the fields and forests surrounding my farm. This, along with walks taken with Tommie, have served to greatly enlarge my knowledge of the plants God has provided for the healing of mankind. Some 1,500 plants later, I was still coming across some that I found necessary to take to Tommie for consultation. 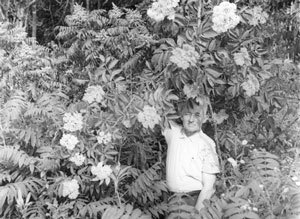 He did not always know what the plant was, but was usually right on the money when it comes to its identification. His ability to recognize herbs and trees from a distance was awesome. Time and experience have left me with nothing but respect for Tommie. He is one of those rare and endangered species; a truly kind and honest person A giver not a taker. At eighty-eight, he has been treating those in his community with herbs for eighty years. At the same time, he has kept alive a true American folk-art. There are many Herbalists around recommending all sorts of strange herbal treatments. But they have absolutely no knowledge of what a medicinal plant looks like in the woods and outside of a bottle. These herbal pharmacists come and go like every other fad. Tommie and those who follow in his footsteps will continue to use simple herbs for healing. If nothing else, he represents stability and continuity in the healing arts. Tommie has kept this tradition alive through good years and bad. 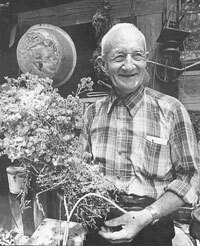 When herbal practitioners were looked upon as hoodoo snake oil salesmen, he kept steadfastly to the path he had chosen to follow in life. He set the stage for those who were to follow. When Tommie is gone, the world will have lost an irreplaceable part of its history and energy that is unlikely to be regained. I feel that it is time for this country, like Japan, to recognize those in its culture who are Living Treasures. Tommie most certainly qualifies as a treasure of unique and exceedingly rare value. Tommie Bass is truly a diamond in a lump of coal. A vanishing resource.